both my grandmothers were exceptional gardeners. they always had flowers and vegetable gardens and could name any plant i pointed out. i say this to encourage myself that deep deep deep down somewhere i have to have some green thumb genes in me. but for now, i'm pretty sure i have a black thumb. woh woh. hey, you've got to give a girl props for trying though, right? i did have one successful plant once, and i cared for him so much i named him spike. but then we moved and he had to stay behind. when we lived in atlanta, we had zero outdoor space. so i decided i'd plant some indoor succulents to at least have a little green. at first they were so lively and cheerful! but sadly in about three weeks they kicked the bucket. i chalked it up to it being in a hot and humid climate, clearly not the right environment for a desert plant to live. 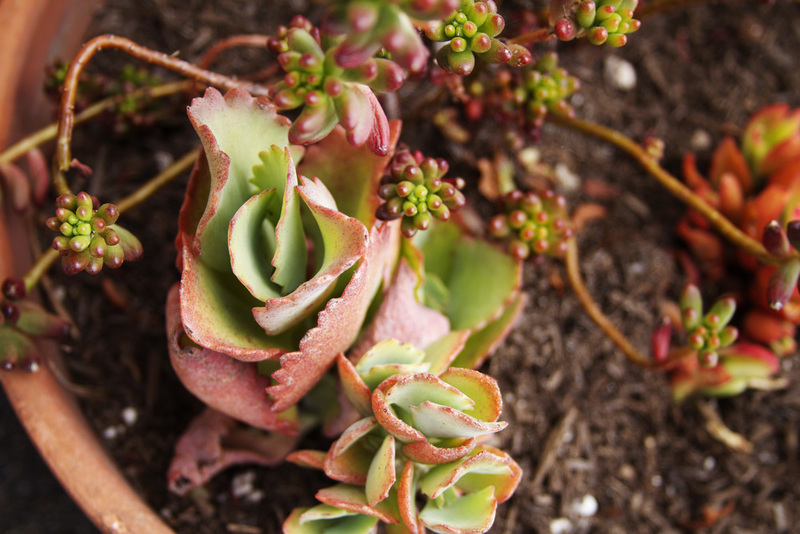 but in my heart i could hear a chorus of plant enthusiasts saying, "start with succulents! you can't kill them if you try!" but, sure enough i had drowned the poor little things (as least i think overwatering was actually what did them in). so, now we're back to LA--the ideal climate for succulents, and i'm giving them a second go. i'm ever-determined to one day have a real, full-fledged garden with tomatoes, cucumbers, and squash! and lots of pretty flowers. for now succulents will do. i bought a few of these (one may or may not have died already), and ganked a couple bits off much larger plants in my neighbor's yard area (they regenerate, right?). i'm watering them only once a week. and so far they are growing and holding up pretty well! God created some pretty kickin' colors, am i right? i mean, it's pretty cool that all these neon shades can be found in nature. Posted on May 8, 2013 by Lauren Wilson and filed under home, pretty and tagged green thumb black thumb plants succulents garden patio grow.